According to the pilot, during an approach in the rain, there were wind gusts, and he retracted the flaps to zero. He noted that, "I decided to land a little faster than the preferred 75-80 mph." The pilot reported that the airplane "did not settle into a normal rollout." He recalled that a few seconds into the landing roll, the airplane veered to the left and exited the left side of the runway. The airplane continued across the safety area and collided with a drainage culvert. The airplane sustained substantial damage to the engine mounts. Photographs provided by the Federal Aviation Administration aviation safety inspector showed three parallel rubber skid markings that began about 1,500 ft from the approach end of the runway. The markings began in the center of the runway and exhibited a sharp left turn that continued along a path through the safety area and stopped at the drainage culvert. The pilot reported that the left main landing gear assembly and tire failed during the landing roll. However, an examination of the landing gear assembly, wheel, and tire revealed that there were no mechanical anomalies or failures before the runway excursion. The METAR at the accident airport reported that, about the time of the accident, the rain was light, and the wind was from 010° at 12 knots. The pilot's loss of directional control during the landing roll on the wet runway. According to the pilot, during an approach in the rain, there were wind gusts and he retracted the flaps to zero. He noted that, "I decided to land a little faster than the preferred 75-80 mph." The pilot reported that the airplane, "did not settle into a normal rollout." He recalled that a few seconds into the landing roll, the airplane veered to the left and exited the left side of the runway. The airplane continued across the safety area and collided with a drainage culvert. Photographs provided by the Federal Aviation Administration (FAA), Aviation Safety Inspector assigned to the accident, revealed three parallel rubber skid markings that began about1,500ft from the approach end of runway 9R. The markings began in the center of the runway and exhibited a sharp left turn that continued along a path through the safety area and stopped at the drainage culvert. The pilot reported that the left main landing gear assembly and tire failed during the landing roll. However, an examination of the landing gear assembly, and the wheel and tire, by the FAA Maintenance Inspector, identified that there were no anomalies or failures prior to the runway excursion. The METAR at the accident airport reported that about the time of the accident, the rain was light, and the wind was from 010° at 12kts. A plane that landed safely at Orlando-Melbourne International Airport went off the runway Thursday afternoon, an airport spokeswoman said. The pilot of the Piper PA-28R-200 Arrow II was hospitalized as a precaution, airport spokeswoman Lori Booker said. The Federal Aviation Administration will investigate how the mishap happened. The plane landed about 3 p.m. The plane is owned by Stephen J. Winter of Mansfield, Massachusetts, according to the Federal Aviation Administration. The pilot's name was not released Thursday. The runway was briefly closed as airport officials inspected it for damages. 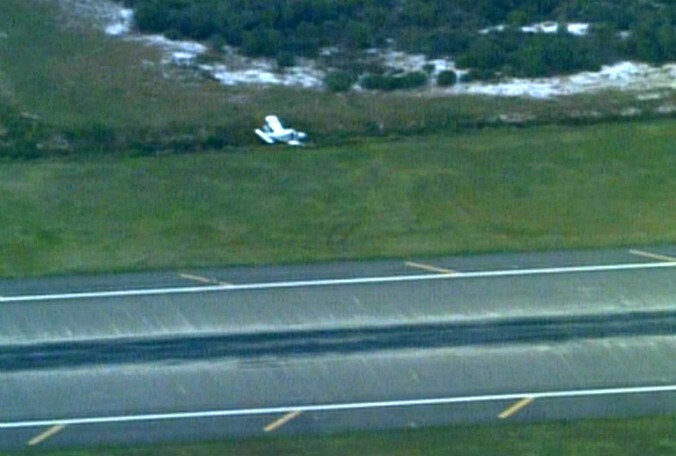 MELBOURNE -- A small plane made a hard landing at the Orlando-Melbourne International Airport on Thursday afternoon. Airport officials said the Piper PA-28R-200 Arrow II was badly damaged after the hard landing, skidding off the runway just after 3 p.m. It's unclear what caused it to go down. The pilot was the only person aboard and was OK. He was taken to a hospital for treatment. The plane remained on the side of the runway a couple of hours later, moved so airport operations could resume. Airport officials said the decision was made to leave the plane where it is until the Federal Aviation Administration could get there in the morning to investigate. The current tach time is 4012.50. DESCRIPTION OF ACCIDENT: Aircraft departed the runway during landing and came to rest in a ditch. Firewall forward is twisted and badly damaged, including the nose landing gear, bent engine mount, crushed air induction tube and buckled firewall.